14-18 NOW is an independent programme, hosted within Imperial War Museums, funded by the National Lottery, through the Heritage Lottery Fund and Arts Council England. 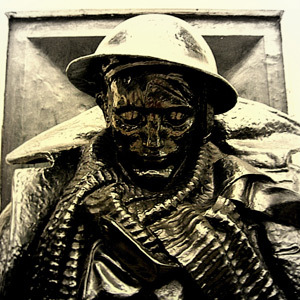 Their latest project, Letter To An Unknown Soldier, is inspired by the statue that stands on Platform 1 of Paddington Station in London, representing all the millions of soldiers who died; a statue of an ordinary soldier in battle dress, reading a letter. In a centenary year full of official remembrance, the team at 14-18 NOW are inviting you to step back and take a few private moments to think: if you were able to write to the Unknown Soldier, a man who served and was killed during World War One, what would you write? All the letters will be collected and published online, alongside those already received from writers including Stephen Fry, Lee Child and Sheila Hancock among many others. Whoever you are, whatever your experience, lend your voice to this UK-wide art project. Letters can be submitted now and will be published from 28 June – a hundred years to the day since the assassination of Archduke Ferdinand which marked the beginning of Europe’s descent into war. The website will remain open until 4 August, the centenary of the outbreak of war. What you write will help provide a snapshot of what people are thinking and feeling in this centenary year. Your letter will help create a new kind of war memorial – one made entirely of words and created by us all.